An ongoing struggle between the philosophy of “Husseiniyat” and syndrome of “Yazeediyat”.. till the time when humanity in general will come to the conclusion, that “Husseiniyat” is the only way of life that can provide sustainable global peace and security. The struggle between Hussein (AS) and Yazeed is an international phenomenon. It is not restricted to Muslims only. Sooner or later other nations of the world will also realize that the cause for which they are struggling now ie global peace and social justice, the same cause was fought for by Hussein (AS) 14 centuries ago. It may not be surprising to see in near future those nations owing Hussein (AS) as their role model. That will be the day when the dawn of peace, tranquility, justice and prosperity will shine on the horizon of this war-torn planet. This entry was posted in Islam and tagged Hussein ibn Ali, Karbala, Peace, Struggle on November 17, 2013 by akhterhayatmalik. The Quranic way of life is a life of action and dynamism. Quran condemns a life of isolation, stagnation and solitude. It is only through dynamism that human society progresses and attains its objective of peace and prosperity in this world and eternal blessings in life hereinafter. During the early period of Islam there was no concept of monasteries. Mysticism is an alien concept and infiltrated in Islam at very late stage. It is binding on Muslims to work hard and excel in every field of knowledge, education, research, science, economics, administration, diplomacy and statecraft. Islam is essentially a ‘Deen’ of ‘Amal’ and lays lot of stress on action. Any society that abstains from action and dynamism will eventually die its own death. Hazrat Imam Hussein (A.S) had inherited a very exalted spiritual position. He is son of Hazrat Ali (A.S) who is ‘Baab ul Ilm’ (the door of knowledge) and Hazar Fatima (R.A) who is the ‘Syeda’ of all women in the world and in ‘Jannah’, and he is grandson of the Holy Prophet (PBUH) whose personality is second to Allah only in this universe. Had he wanted to, he could have made Madina as his spiritual base and the Muslims from the whole world would have pledged their allegiance to him as a Saint. But Hussein (A.S) was aware of the basic teachings of Islam and knew what Islam wants from its followers. 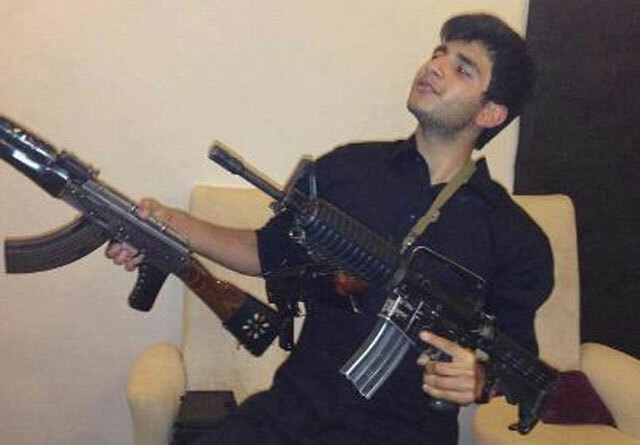 He knew that if the Muslim Society of his time was to be purged from the ills, he must rise and stand up against the forces of exploitation and tyranny. He therefore proceeded to Karbala, with a total disregard to safety, comfort of his person and that of his family. 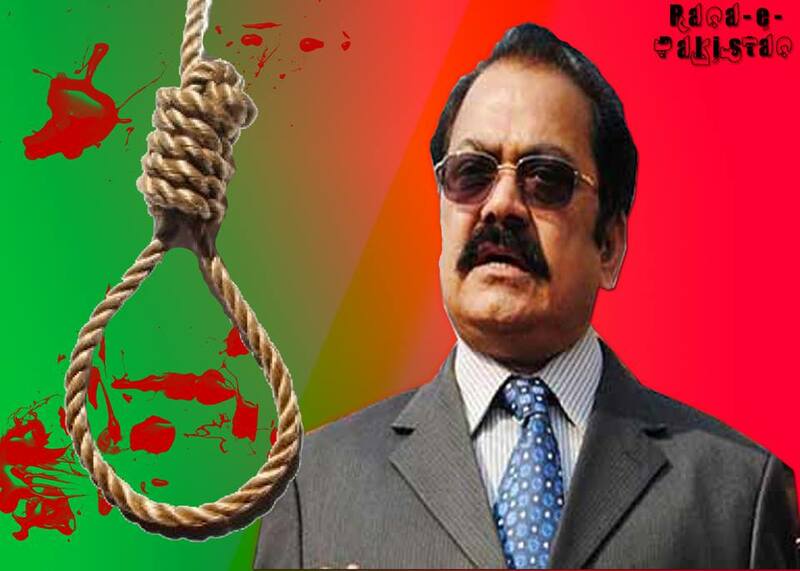 The ‘Yazeedi’ forces of today have made the life of innocent people miserable. They have usurped all the resources and have deprived the poor people from bread, water, health, education, jobs and safety of their lives. Karbala gives us a clear message that if the poor people want to get their basic rights, they must rise and stand up against these tyrannic forces without any fear, as Hussein (A.S) did 14 centuries back. This is the only way to break this lethal inertia that is taking our society to devastation with every passing day. This entry was posted in Islam and tagged Hussein ibn Ali, Islam, Karbala, Quran on November 17, 2013 by akhterhayatmalik. 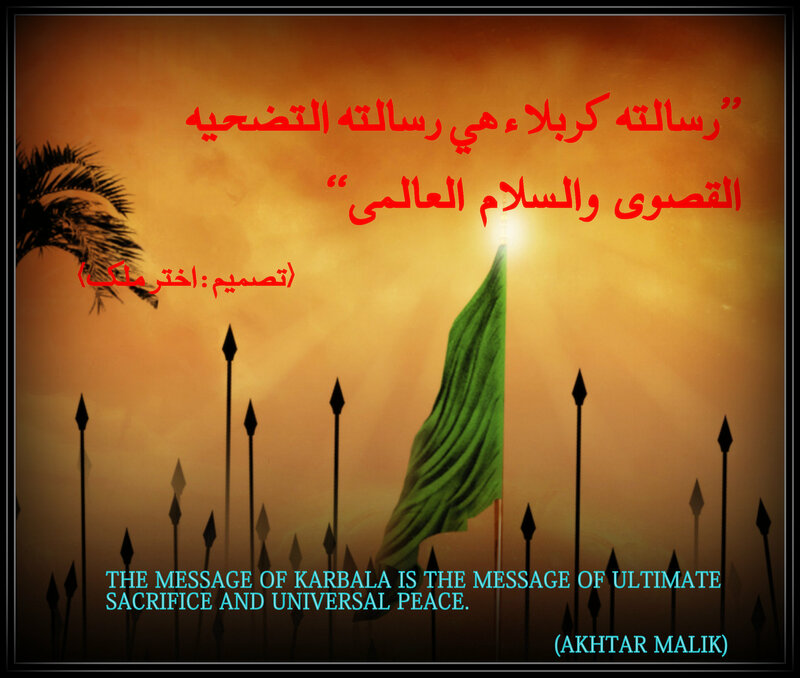 The message of Karbala is the message of ultimate sacrifice and universal peace. Durable peace cannot be ensured without sacrifice. The enemies of peace have many weapons to use against humanity. Apart from aggression, tyranny and killings through blatant use of arms and ammunition, they also use the weapons of wealth, greed, hate, lust for power and exploitation. Man by nature is prone to be influenced and affected by such attractions. This weakness of human nature is very skillfully exploited by the enemies of peace to serve their own interests. Those who fall prey to them are used as tools of war, violence and anarchy in the world. The only formidable obstacle in the way of enemies of peace is the strength of character of men who confront them. When a person is strong in character he can parry all sorts of invitations to lusts. A man of strong character can never bend and bow before the threats and is always ready to sacrifice even the most precious of his assets. Hazrat Imam Hussein (A.S) displayed the strength of his character in the battlefield of Karbala. Had he desired so, he could have got the best luxuries of life from the rulers and powerful elite of that time. But he stood firmly on the golden principles of Islam and offered the biggest sacrifice ever in the history of mankind. 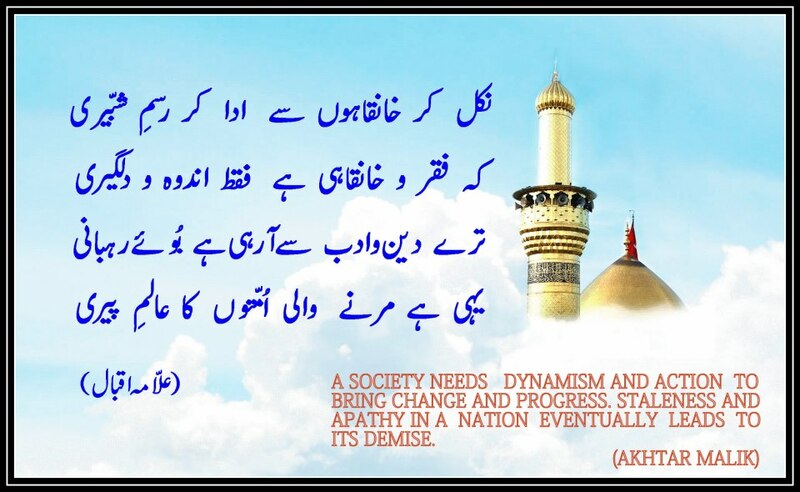 Karbala gives a clear message to people, to come out of the shackles of lust for power, wealth, properties, business empires, bank balances and nepotism, if they want a durable peace in human society. This entry was posted in Islam and tagged Hussein ibn Ali, Islam, Karbala, Sacrifice on November 17, 2013 by akhterhayatmalik. إِنَّ اللَّـهَ يَأْمُرُ‌كُمْ أَن تُؤَدُّوا الْأَمَانَاتِ إِلَىٰ أَهْلِهَا وَإِذَا حَكَمْتُم بَيْنَ النَّاسِ أَن تَحْكُمُوا بِالْعَدْلِ ۚ إِنَّ اللَّـهَ نِعِمَّا يَعِظُكُم بِهِ ۗ إِنَّ اللَّـهَ كَانَ سَمِيعًا بَصِيرً‌ا“ No doubt Allah commands you to render trusts to whom they are due, and when you rule among the people, rule with justice. 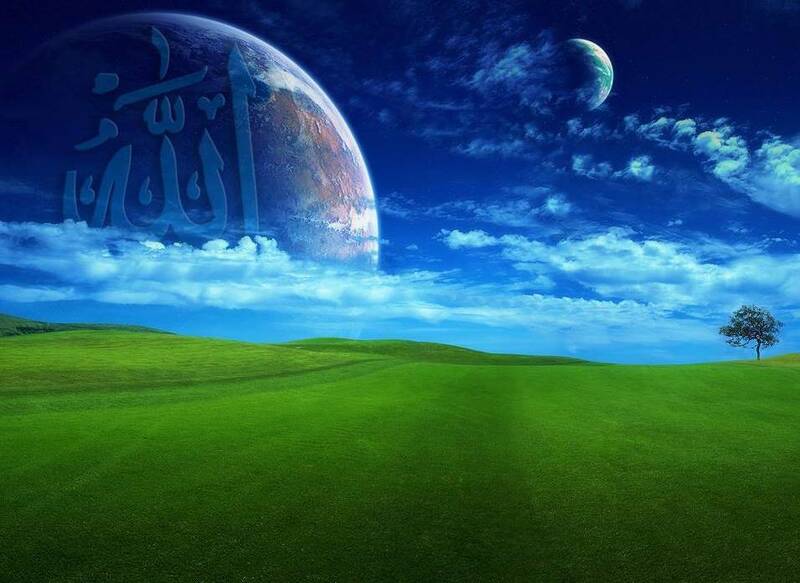 Excellent is that which Allah instructs you. No doubt Allah hears and sees (everything).”This Aya sets the foundation of a political system to be established in an Islamic state. People are the custodians of the sovereignty given to them as a sacred trust and they are constrained by Allah to return this trust to persons who are capable to hold this trust. Those persons (trustees) will then run the affairs of the state with justice, in accordance with the principles of Quran and Sunnah. In earlier days of Islam (during the tenure of Four Caliphs), people used to transfer this trust to the Caliphs through pledge (بیت). In today’s world of knowledge, enlightenment, awareness and democracy, this exercise can be done through voting, referendum, opinion polls or whatever system is deemed appropriate. The relevant Articles of the Constitution of Pakistan as read in conjunction with the above mentioned command of Allah makes the social contract between the people of Pakistan and the State of Pakistan very clear. Both have their specific duties to perform and obligations to discharge. Participating in electoral process (or any such activity that leads to transfer of sovereignty to the state through chosen persons) and casting vote in favor of persons who are ‘Trustworthy’ and ‘Truthful’ is compulsory as per Quran. Those who abstain from this process on any pretext will be willfully withholding الْأَمَانَاتِ against the explicit command of Allah. The people of Pakistan from all strata of society should be educated on these lines. This is the only way to get rid of the exploiters and looters from coming to power. This entry was posted in Islam and tagged Islam, People, Sovereignty, Trust on March 31, 2013 by akhterhayatmalik.